SOUTH WALTON, Fla. – Located in Santa Rosa Beach, Fla., Grayton Beer Company is pleased to announce its newest seasonal beer, Gourdgeous, a limited-release beer which began pouring into retailers, bars and restaurants this week. With an alcohol by volume (ABV) content of 5.4 percent, the new Gourdgeous beer was crafted with 300 pounds of fresh pumpkin pulp added to a classic ale base then delicately spiced with fresh ginger root, coriander, allspice and cinnamon sticks. 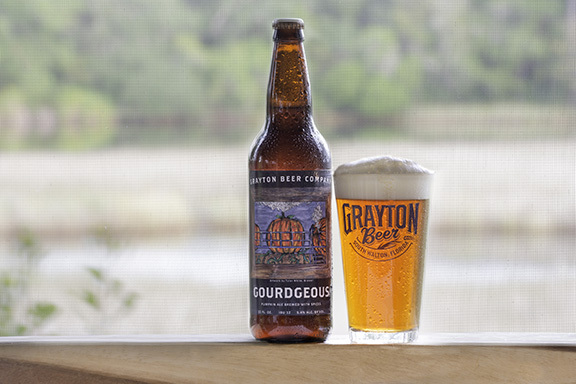 Currently in draught in various bars and restaurants, Gourdgeous will also be Grayton’s first brew offered in 22 oz. bomber bottles, which will be available this week in locations that carry the South Walton brewery’s other beers. Gourdgeous will also be the first in Grayton’s “artist series” – a challenge Grayton Beer put out to local artists to design selected 22 oz.-labeled beers. The artwork used was created by Grayton Beer’s own brewer, Tyler White, and is a play on Grayton’s brew system using pumpkins in place of brewing vats. A portion of the proceeds will go toward art-based initiatives and charities in the Panhandle. Grayton Beer Company currently offers five other beers in its list of brews that range from the Amber Ale, which carries the name 1890 Founder’s Ale, the Belgian White, or Witbier, named White Dunes, the Pale Ale, Grayton’s flagship product – the Original, to the 30A Beach Blonde Ale, which incorporates 30A.com’s iconic blue logo. For more information or to reach Shankwiler or Price, please contact Audrey Pannell at (205) 503-5955 or audrey@styleladvertising.com. Founded in 2011, Grayton Beer Company is a locally owned and operated brewery on the Northwest Florida Coastline with an over 30,000 sq. ft. state-of-the-art facility to brew classic, contemporary beers. Grayton Beer Company brews its beers with an easy-going, approachable Gulf-coast state of mind, using the finest available ingredients to provide pure, simple refreshment. For more information, visit www.GraytonBeer.com.